The giving away of the bride to the groom by her father after they walk down the aisle together is a time-honored wedding tradition. Today this custom is seen as an opportunity for thankfulness; for the father to give his blessing to the marriage & for the daughter to thank her parents for all their love and caring. This exchange is always full of meaning. I love how every face you can see in this image, including all the guests, is focused on the moment - there's a real sense that this is a momentous occasion. 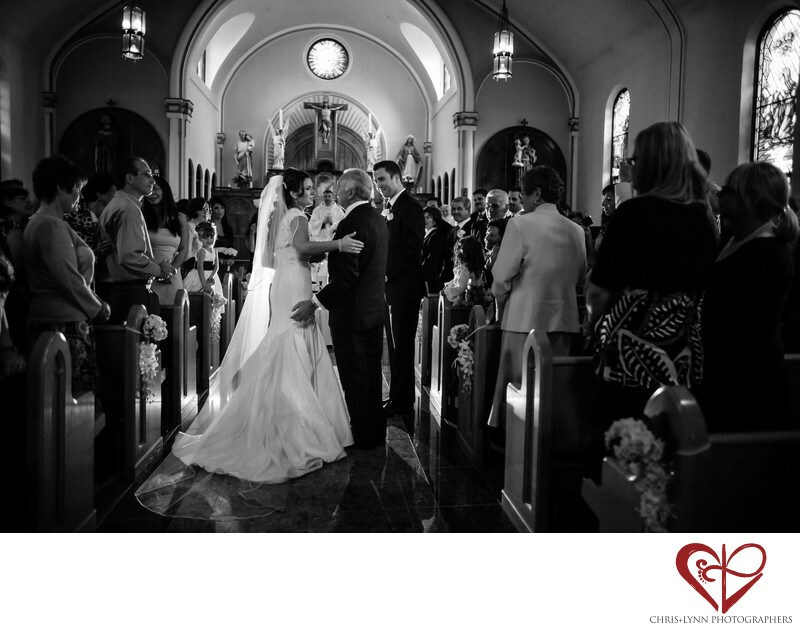 The natural sunlight streaming through the stain-glass windows and the glow of the bride's veil add a lightness to this to serious image of a classic moment. And not a cell phone in sight! When we shot this image almost a decade ago, smartphones were not yet a thing. Ceremonies were solemn, important occasions. Too often today it seems like destination wedding ceremonies have become an occasion for wedding guests with iphones to compete with each other for the best Instagram shot of the bride coming down the aisle. We always encourage couples to have an 'unplugged' ceremony, where the wedding officiant will ask guests to leave their smartphones & cameras in their purses. To find out more about unplugged ceremonies, check out this excellent post on Junebug Weddings - "Why You Want an Unplugged Ceremony, We Promise". 1/400; f/1.4; ISO 800; 24.0 mm.